Survival snares can be an effective way to harvest meat in an emergency survival situation. Bear in mind that you must be very familiar with them before a real survival situation in order to use them successfully. Primitive traps are illegal unless one is in a survival situation that is not self-induced. Also, traps are very dangerous. They are meant to kill. So don’t go setting a trap in your backyard if your neighbors have cats, dogs, or small children. There are many different types of snares. All of them require cord of some sort. Whatever the cord, it should be strong and flexible. Snare wire and waxed thread are modern cords that work well. Primitive cords that can be used are sinew and plant fiber cord. 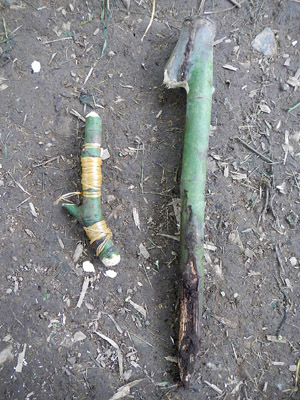 The second piece of the survival snare puzzle is the trigger stick. 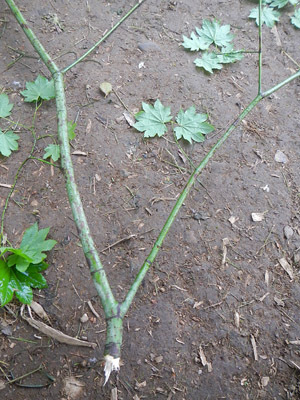 The only requirements for a good trigger stick are that it be strong enough to hold when the trap is set and that it has an acutely angled branch (see above). 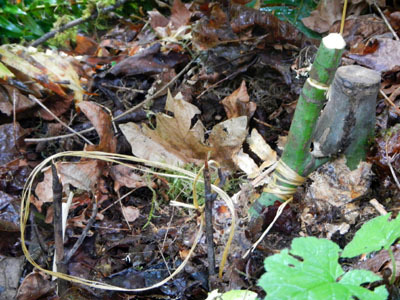 The last thing that may or may not be needed to set a survival snare is a stake. A stake is a long (about 2 ft.), pointed stick with a notch in it. Now that you have your cord and your stick you will need to connect the two. 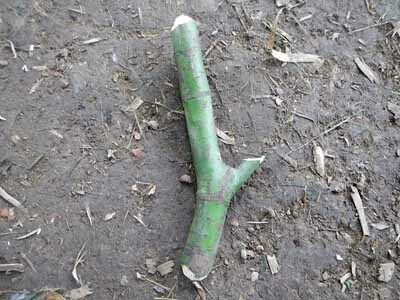 I cut the stick down to size first. Then I carve a ledge in the branched part of the trigger stick that is perpendicular to the thick part of the stick (see below). Next I like to carve two divots into the thick part of the stick. One of those divots is below the branch and one is above, toward the end of the trigger. These divots prevent the cord from slipping off the stick once it is tied on. Now it is time to tie the cordage onto the stick. You will need two lengths. 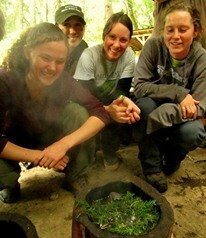 The long length of cord will be tied to a counter-weight, a springy sapling or a stake in the ground. The short length will be the loop that is used to capture the animal. For attaching the cord to the stick, I like to tie a loop knot that I can cinch down to the circumference of the divot. Remember that fishing knot your grandpa taught you? It is time to use it again. For the loop that will capture the animal, I tie either a rolling bowline or a fixed bowline with the main length of cord passed through the loop (for details, see bowline knot article). Making the stake is the easiest part of the survival snare. First, you want to carve a point on one end of the stick. It should look like a vampire slayer. Next you will want to carve a ledge into the stick toward the top. This ledge should be cut perpendicular to the length of the stick. This is important because the contact between the ledge of the stake and the ledge of the trigger stick is what sets the snare. A colleague of mine once said “trapping success is 10% construction and 90% placement.” I disagree. I think it is more like 30/70. The point is made nonetheless. Knowing what animal you are targeting with the snare and locating recent track and sign of that animal is crucial (see wildlife tracking courses). In addition to recent sign of an animal’s passing, you want to place your survival snares near funnels. 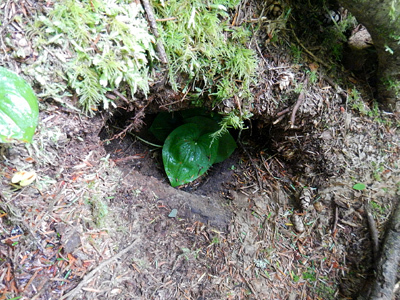 These include burrows, narrow trails, runs, and at the base of trees (for squirrels). Below is pictured the burrow entrance of an aplodontia (Aplodontia rufa). Different situations call for different ways to set the snare. If there is a springy evergreen sapling close to the funnel, then you can tie the longer length of cord off to that. 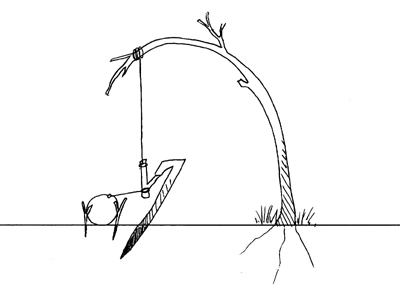 Here is an illustration of how one might utilize a bent sapling to set the snare. Notice how the tension is kept in place by the small area of contact between the trigger and peg that is staked into the ground. 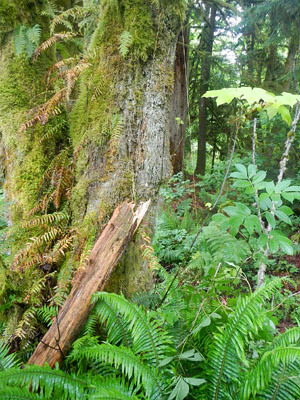 If there is a larger tree with a branch above the funnel, then you can tie the long length of cord to a counter weight (like a stone or a log) and hoist it into the air to set the trap (as in the photo below). If neither of these features is available the snare will need to be set to the stake itself near the funnel. This makes the snare static rather than rolling. There are many types of survival snares that work well for different situations. This basic snare design is the basis for all others. Some other snares I recommend learning are the T-bar snare and the Apache Limp Wire.